Ever since Ryder could remember, it's always been just Ryder and his mom. But in one day, everything changes. Ryder's mom is in the hospital fighting for her life after being struck by a truck while crossing the street. When he learns that his mom will need an expensive operation to survive, he steps up to the plate. Ryder finds in his mother's closet a letter and a baseball signed by a Major League Baseball player, and he's sure the signature is his father's. So with this clue and the help of his next door neighbor and a New York City firefighter, Ryder goes on an epic quest to find his father and get the support he needs to save his mom. 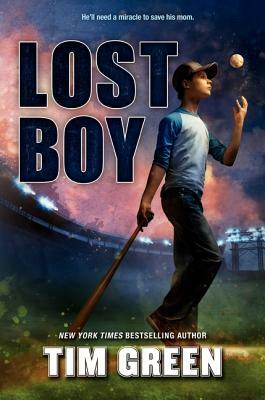 But will everything fall into place in time, or will Ryder become a lost boy forever? Tim Green, for many years a star defensive end with the Atlanta Falcons, is a man of many talents. He's the author of such gripping books for adults as the New York Times bestselling The Dark Side of the Game and American Outrage. Tim graduated covaledictorian from Syracuse University and was a first-round draft pick. He later earned his law degree with honors, and he has also worked as an NFL commentator for FOX Sports and NPR. His first book for young readers, Football Genius, inspired in part by his players and his own kids, became a New York Times bestseller and was followed by Football Hero, Football Champ, The Big Time, and Deep Zone. He drew on his experiences playing and coaching Little League for Rivals and Pinch Hit and two more New York Times bestsellers: Baseball Great and Best of the Best. Bestselling author Jon Scieszka called Tim Green's Unstoppable, a book about a boy's struggle with cancer that debuted at #2 on the New York Times bestseller list, "Absolutely heroic. And something every guy should read." Tim Green lives with his wife, Illyssa, and their five children in upstate New York.